This course presents a complete, two-hour program of scientific, mystifying and comical hypnotic stage entertainments that can be presented after studying this all-inclusive course. Audiences love to witness hypnotic stage acts! Now you, too, can be a stage hypnotist with your own show. Written by an experienced operator (and owner of a stage hypnotic show), this course provides authentic instructions for performing a complete evening's entertainment. Not only does this course teach how to do many wonderful hypnotic tests, it also provides the complete routine of your show, tells how to select the proper audience subjects, how to operate your own show, publicity stunts, and all the details. 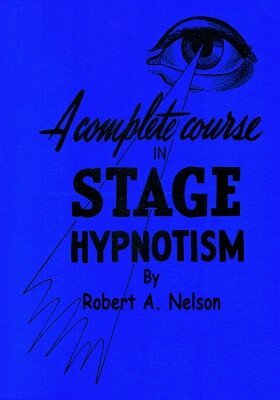 You require only the inside knowledge of stage hypnotism - as found in this ebook. Many students study for years, attempting to duplicate the feats of stage hypnotists, not realizing that the act is a combination of suggestion and 90% trickery. It's the trickery element that has been a jealously guarded secret of the professional hypnotists ... until now! Professional "hyp" acts travel light, without the need for cumbersome illusions, animals, baggage or ornate sets. You are the show! No matter what the occasion, you are ready to perform. Present your own full-evening show at casinos, in night clubs, on theatre stages, at colleges, or corporate events. Use them to garner unrivaled publicity to boost your career. Or add one or two stage hypnotic effects to your existing mentalism or magic show. A few of the tests included: The Rigid or Great Rock Breaking Test; Scientific Bloodless Operation (placing four or five steel needles through the body); 24 to 48 Hour Window Sleep (one of the greatest publicity stunts of all); Hypnotism by Radio; Group Hypnotism; Barnyard Test; A-B-C Lecture; Hot or Cold; Bumblebees; Whirling Arms; Forward and Backwards Test; Feet Fastened to Floor; Hands Frozen Together; Subject Cannot Move from Chair; and more. This course also contains the contents of three manuscripts that were sold separately in the Nelson Enterprises catalog : The Sensational Hypnotic Rigid Test (#202); Instant Pseudo Hypnotism (#52); and Hypnotism on Animals (#331). 1st edition 1950; 1st digital edition 2017, PDF 56 pages.